^ "introduction". Lausd.k12.ca.us. Retrieved 2010-08-17. ^ "Housing". Lausd.k12.ca.us. Retrieved 2010-08-17. ^ "clothing". Lausd.k12.ca.us. Retrieved 2010-08-17. ^ "About Montebello". 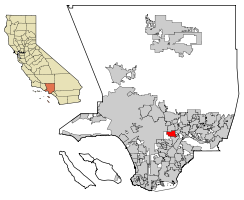 City of Montebello. 1920-10-19. Retrieved 2010-08-17. 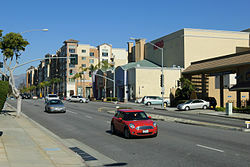 ^ "A Brief History of Monterey Park, California". Krafted by Kelly. Wordpress. 2010-08-19. Retrieved 31 December 2018. ^ Kirsch, Jonathan (February 7, 2001). "A Chronicle of Triumph, Pain in Chinese American Community". Los Angeles Times. Retrieved 18 January 2016. ^ Berthelsen, Christian (August 20, 1999). "Frederic Hsieh Is Dead at 54; Made Asian-American Suburb". The New York Times. Retrieved 5 July 2018. 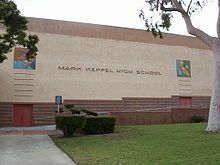 ^ "Mark Keppel High School". Mkhs.org. 1999-12-31. Retrieved 2010-08-17. ^ "Local News in Brief : Building Bans Imposed - Los Angeles Times". Articles.latimes.com. 1988-05-12. Retrieved 2010-08-17. ^ Berton, Justin (2010-06-05). "Whites in state 'below the replacement' level". Sfgate.com. Retrieved 2010-08-17. ^ DOUGLAS QUANThe Press-Enterprise (2007-02-06). 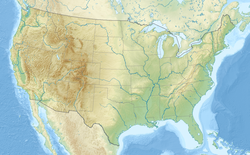 "Riverside County | PE.com | Southern California News | News for Inland Southern California". PE.com. Retrieved 2010-08-17. ^ "Garvey Ranch". Retrieved 2011-08-10. ^ a b c d e f g Eng, Dinah (2006-03-05). "A community's Chinese connection". Los Angeles Times. Retrieved 2017-01-03. ^ Nelson, Valerie J. (November 15, 2012). "Wilbur K. Woo dies at 96; a leader of L.A.'s Chinese community". Los Angeles Times. Retrieved 2012-12-01.